This week we will be checking out a dinosaur that changed the way we think about feathers. Enter Yutyrannus huali! Yutyrannus was a meat-eating dinosaur that lived in what is now China during the early Cretaceous Period, about 125 million years ago. It was large, measuring about thirty feet from snout to tail as an adult. 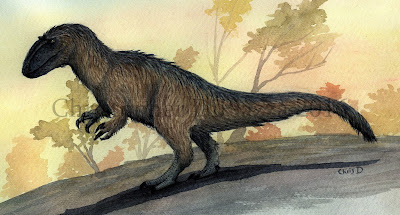 The genus name, Yutyrannus, translates to "Feathered Tyrant" because, as you're about to learn, it had feathers! Yutyrannus life reconstruction by Christopher DiPiazza. Yutyrannus belonged to the tyrannosauroid group, and was closely related to other dinosaurs like Guanlong, Eotyrannus, and Dryptosaurus. Like them, it had characteristic curved, serrated teeth, and strong front arms, each tipped with three hooked claws. It's later relatives would eventually develop the well-known two-fingered front limbs, best known in its slightly more distant relative, Tyrannosaurus. Adult Yutyrannus also possessed a short horn in front of each eye and a ridge-like bony crest running down the top of its snout. These features may have been used combat between rivals, or display within its species. Yutyrannus had strong legs, but its foot bones were relatively short compared to those of some other theropods, suggesting it wasn't an extremely fast runner in life. It may have been better at ambushing, and then using its size and power to take down prey, rather than chasing it very far. Yutyrannus cast mounted at the American Museum of Natural History in New York. Yutyrannus' real claim to fame, however, is the fact that we know for a certain it had feathers. This is due to actual visual presence of fossilized feathers found on the remains of the three specimens that are known. Because of the placement of these feathers, which includes the bottom of the pelvis, the tail, the arms, and the ankle, it is likely that in life, it had a more even coat of plumage over most of its body. This evidence makes Yutyrannus the largest dinosaur known to date with actual fossilized feathers. 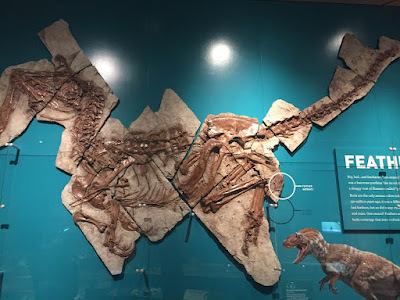 (Other large dinosaurs, like Deinocheirus, show evidence of having had feathers by having a pygostyle, but not actual fossilized feathers found with its bones, which is what we have with Yutyrannus.) These feathers weren't preserved well enough to tell exactly what kinds of feathers they were, but they most likely would have been somewhat shaggy in life, similar to those on modern ground birds, like emus or kiwis. 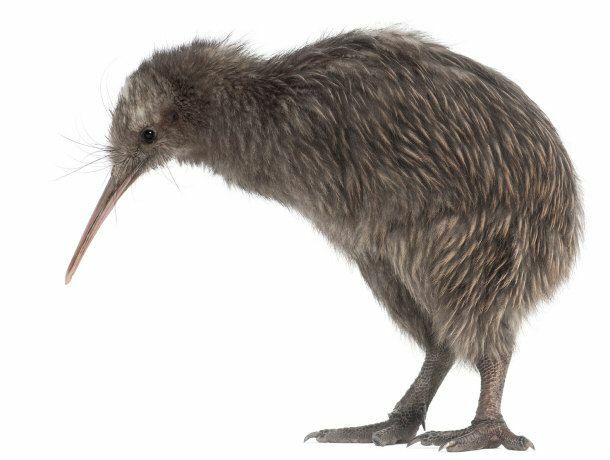 Shaggy kiwi. If you're even in Maryland, check these guys out at the National Zoo. So why feathers? This is the first question that many people ask when learning about Yutyrannus. A better question might be "why not feathers?" Feathers are a versatile adaptation. They can keep an animal warm when the environment is cold, but also cool when the environment is too hot. They also serve protection against the elements like precipitation or the sun, can help camouflage by obscuring the animal's basic body shape, and can aid with communicating to other members of the same species in a visual and/or behavioral way. Thanks to finding Yutyrannus, we now think it is more than likely that tyrannosauroids all had feathers in some form, including T. rex. 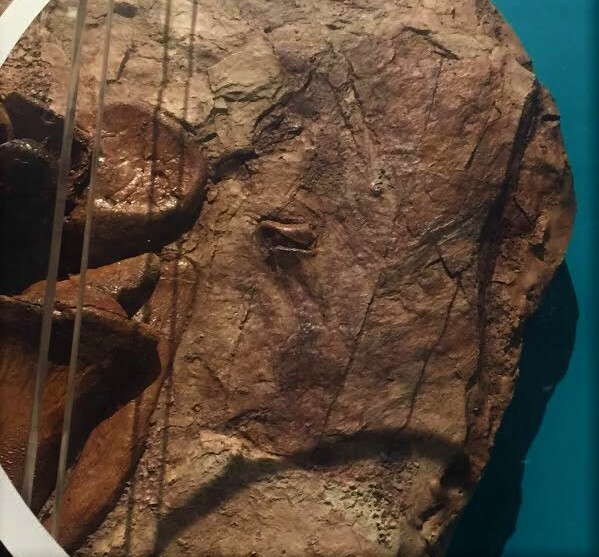 Preserved feathers on the ankle (you can see the bones on the left) of Yutyrannus on display at the American Museum of Natural History in New York. If you live in the New York / New Jersey area you can come see a cast of the famous Yutyrannus fossil, as well as remains (casts and real fossils) of many other important feathered dinosaurs at the American Museum of Natural History's seasonal Dinosaurs Among Us exhibit, which closes in January, 2017. Maybe I'll see you there! That is all for this week. As always feel free to leave a comment below or on the facebook page. Xu, X.; Wang, K.; Zhang, K.; Ma, Q.; Xing, L.; Sullivan, C.; Hu, D.; Cheng, S.; Wang, S.; et al. (2012). "A gigantic feathered dinosaur from the Lower Cretaceous of China" Nature 484 (7392): 92–95. I agree. Which is why Yutyrannus is so exciting. From what we can see and deduce from its fossils, it gives us new information to think about.